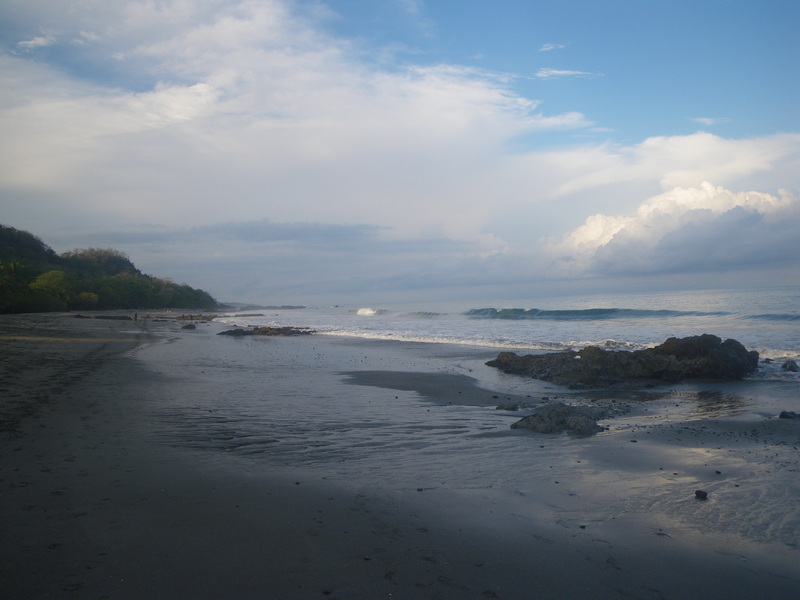 Don’t get me wrong – it’s nice to be home and see everyone, but I miss Costa Rica already. 12 days is not enough time! Stef and I had a very stressful day yesterday. 12 hours in transit + achy bodies from rafting… not a winning combination! White water rafting was amazing, but it wasn’t my first time. Stef and I had tried it a few times in Ottawa, Canada. In comparison, Ottawa was much better! Sounds funny, right? 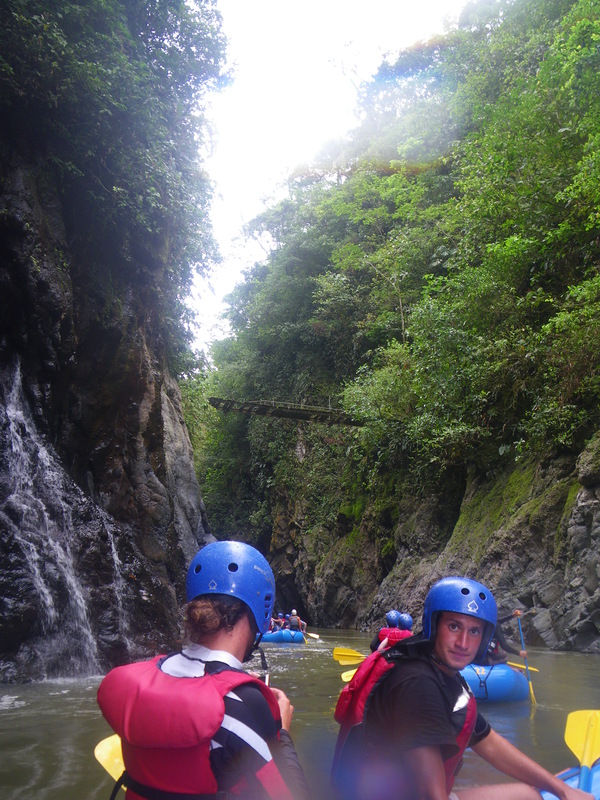 I think it’s because the water levels were too low in Costa Rica for some wet and wild fun. It was still very scenic and bit challenging. We almost missed our connection flight, so we had to run across the Houston airport in about 5 minutes to make our flight. Thankfully, we made it just in time with around 30 secs to spare before they closed the gate. As you can imagine, we were all sweaty and short of breath after our vigorous run. Everyone on the plane looked at us like we were a couple of crazies. Today is my day to recharge. Starting tomorrow and for the next couple of months, I will be taking two university summer courses, writing for MediaDuo (and getting paid this time! ), and working at the Gap. It’s going to be a busy summer, that’s for sure! The trek from Monteverde to Montezuma wasn’t so easy after all. Sorry for not updating! Our hostel in Montezuma didn´t have the Internet. Travel woes. We’ve been having an amazing time. I guess I should start with Monteverde…. 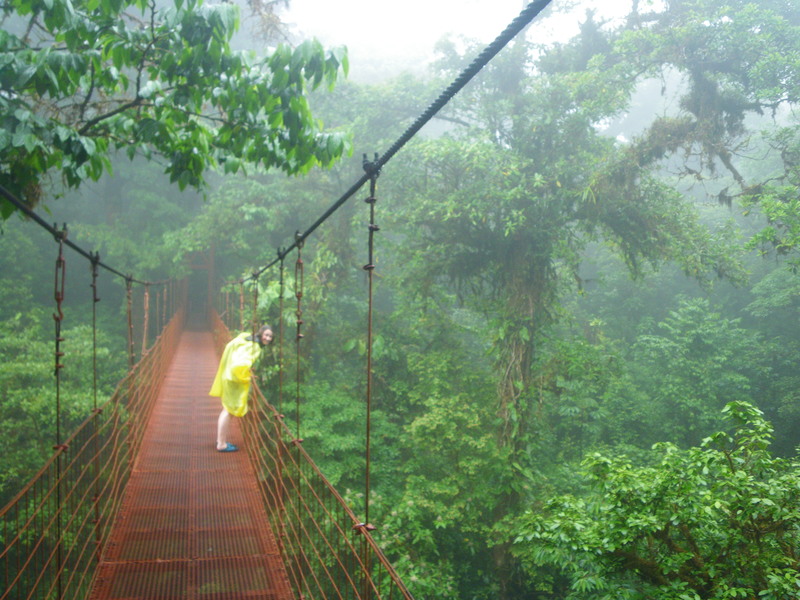 So, although we’re in Monteverde now, I still need to catch everyone up on our La Fortuna adventures. 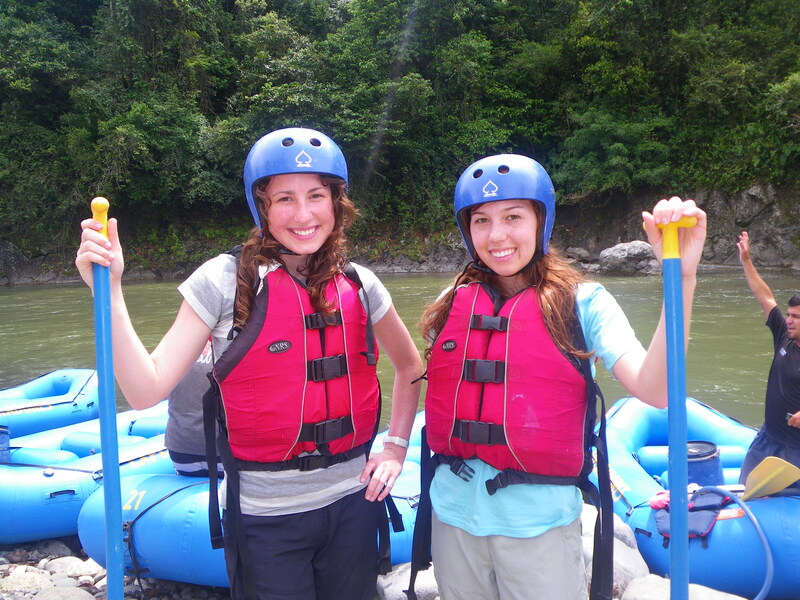 We did two tours in La Fortuna: horseback riding and a volcano hike. We booked both of the tours with the Arenal Backpacker’s Resort. We left around 8 am for a 4 hour ride in La Fortuna. It cost only 35$ and thankfully, it was just the two of us. We were galloping in the valleys, through streams, uphill, etc. It was amazing, but my tush hurt after a while. This keyboard doesn’t have the right symbols, but if it did I would do a sad face. My horse and Stef’s horse were racing each other, and they both wanted to be the leader. One time, stef’s horse took a bite at mine, but my good ol’ boy was too fast for that nonsense! We rode up to a rest spot, left the horses and then hiked up a smaller hill to overlook Pino Blanco, an emourmous waterfall, then we hiked down to see the La Fortuna Waterfall, and (WOW) it was magestic! First, we went for a dip in the run off water. It was very cold, but quite refreshing. Later, we hiked to the where the waterfall pools. There were some ticos (Costa Ricans) swimming, so we figured it was safe enough. We stayed near the edge and it was fine. I miss it already! However, I do NOT miss the hike back up. It was trecherous! I think it was over 400 stairs, and by stairs I mean Costa Rican stairs, which are basically just dug outs with a board of wood. On our way back with the horses, we heard some howler monkeys, so our guide stopped us and tied our horses to a nearby tree. He led us into the bush, no trails, nothing and we followed the howler monkey’s call. We saw him high up in the trees…. this was our first sight of a wild howler monkey, but it wasn’t our last! The ride ended at a butterfly garden and frog pond. I hated the butterfly garden because they freak me out. I think butterflies are nice from far away, but they are freakish looking up close. I hate it when they land on me. There are still insects! The frog pond had some turtles and poisonous frogs… both red and lime green ones. Our guide just picked one of the poisonous frogs up to show it to us up close… then he just rinsed his hands in the pond water. All better? I think NOT! We arrived at the tour in a nice air conditioned van, but on our way back, we rode in the front of a man’s pickup truck with another random guy in the cab. The driver dropped off his friend and then he dropped us off. I don’t mind sharing, but it was strange. Later that night, we went on an Arenal volcano hike. First, we went on a guided rainforest hike where we saw army ants, leaf cutters, toucans, and sensitive plants. There is only one case where a human was eaten alive by army ants. It was a Brazilian man who got drunk and passed out in the rainforest. They are so tiny, but there are millions of them. I’m surprised there aren’t more deaths! Advice: do not pass out out in the rainforest. The leaf cutter ants are pretty cool. Millions of them carry pieces of leaves up and down trees and along the ground. We took some videos, which I will hopefully post on Facebook later. However, we also saw more howler monkeys… maybe 5 or 6, but the guide said there could have been more. They were quiet, but more active. After staring at them for a bit, the monkeys started peeing and pooing, so we had to get out of the way! You don’t want to walk away from that battle defeated! When we were finished the hike, we went to the Arenal Volcano observation point. I guess there is a 50% chance you’ll see lava. Our guide was telling us to cross our fingers the whole way! And guess what.. we saw lava! It was beautiful. At the base of the Arenal volcano, there are very dangerous gases that can kill people, so we had to be far enough away to view it. The pcitures didn’t turn out so well, but hopefully the memory lasts forever. That was the second time I’ve seen molten lava. When I was visiting family in Hawaii, I saw active lava a foot from my feet – too close! At Arenal, it was very far away. The next morning, we left for Monteverde where the cloud forest is. We took the “jeep boat jeep” method of getting here. The boat ride provided a great view of the volcano. Our hostel here in Monteverde is called Sleepers Sleep Cheaper and it costs $30 for two nights in a private room, including breakfast. It feels like we’re staying with a host family. The owners live downstairs and they have the hostel rooms upstairs. There are 3 younger kids who are so cute and friendly. It’s a nice change from La Fortuna. It’s also much cooler in temperature here and is really refreshing. We’ve done some amazing tours here as well, but I’ll leave that for the next entry. Tomorrow morning, we wake up at 5:30 am to catch the 6 am bus the Puntarnus. From there, we’ll be taking a ferry across to Montezuma. I cannot wait for some beach time! It will be nice to just sit, relax and hopefully get a tan! Stef and I have been incredibly busy and having a blast. So, there are definitely a few things to blog about 🙂 Here are some highlights so far…. So, after 12 hours of transit, Stefanie and I are finally in San Jose, Costa Rica. The morning started off okay. We were at the Detroit airport quite early, so we took a short nap before boarding, then it was off to Houston, Texas. I was a little nervous about Houston because of the whole Swine Flu debacle, but the airport seemed completely normal, aside from the fact the some people were wearing face masks. It´s strange because everyone at the San Jose airport was wearing masks and gloves. A bit freaky…. When we finally arrived in San Jose, we decided to take the local bus downtown. It was a little confusing at first, but then we saw a guy we met on the plane who mentioned he was also taking the bus and just followed him. We paid 400 colones for the ride, which is basically $1 USD. Once we were downtown, we hailed a cab and zoomed through the streets towards San Pedro, where our hostel is located. For a 10 min ride, it cost approx. $4. The drivers here are fearless. The cut each other off, honk their horns, and squeeze in between other vehicles like it´s nobody´s business. I was a little scared, but we made it to our hostel in one piece. We´re staying at Hostel Bekuo. It´s in a nice, quite area. After we checked in, Stef and I hit the streets in search for some dinner. We wandered into the university area. We found a small diner, which Costa Ricans call a soda. We had some language difficulties, but we managed to order some rice, chicken, beans, salad, juice, and plantains all for just 4$. It was a ton of food. 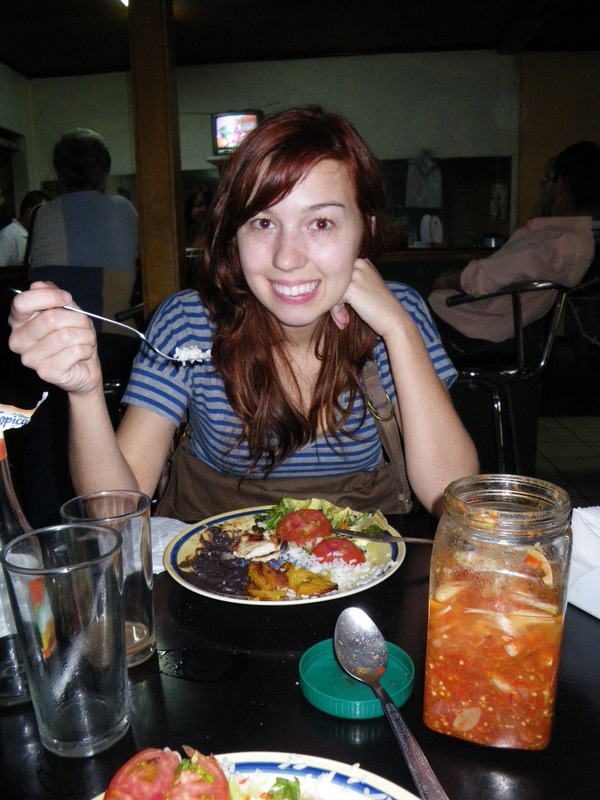 The waitress called the dish a casado and I guess it´s pretty typical around here. I´m sure we´ll be ordering the dish every day. So cheap, so good. Very backpacker friendly! I forget to mention, my ear has been bothering me since last Thursday. The right ear feels plugged, but my sinus pills are worthless. So Stef and I decided to check out the local pharmacy. Basically, you walk in and there is a large counter. You tell the person what´s wrong, they go in the back, and bring you some medicine. No prescription, no I.d., nothing! I got ear drops for around $7.50. In Canada, I would have needed a prescription or they would cost at least $30. Funny enough, the guy behind us got Moxicilline (an antibiotic). Definitely, not what we´re used to. We walked back to the hostel and put the mystery drops into my one ear. I freaked out a little, but so far, so good! I hope it works. It´s driving me nuts! Tomorrow, Stef and I are taking a 4 hr bus ride to La Fortuna to see the Arenal Volcano, one of the world´s most active volcanoes. I can´t wait! It’s 11:00 pm and Stef and I are waking up in 4 hours and flying to Costa Rica. Weather report: thunderstorms everyday…. great! A little rain can’t hurt any new backpacker. Did I mention I’m nervous? Oh yes. And excited. This is going to be amazing. Hopefully, our hostel has free internet and I’ll update on the flight. From catching our connection in time to figuring out the local bus system, I hope everything goes swell. Originally, I created this blog as a space to write about my travels, but why not more? I can’t guarantee that I’ll have a bunch of interesting and quirky stories for everyone to read, but it’s a start. This is a chance for all the lovely people and fellow backpackers out there to be in tune with my travels, my goals, my life…. A blog is also a useful distraction tool. For example, I’m suppose to be studying for my last exam right now. In any case, welcome to my blog and enjoy the travel musings of a novice backpacker. PS: read my previous post for a heads up on my next adventure! My friend Stefanie and I will be leaving on a jet plane in one month. Destination: who cares? We’re getting out of here (aka Canada) for 12 days! We’ll be arriving in San Jose, Costa Rica on April 30th for a jaunt through the best (i.e. most affordable) spots this small Central American country has to offer.